I’ve had a string of bad luck with the bike this year, each time disabling the bike. The starter relay went bad near the beginning of the year. Then in April, the ring antenna fried. I lost another starter relay in May and then June, and then another ring antenna this month. Well, it turns out that my starter motor has been on the outs for quite a while. I realized this after the second starter relay went bad. I went back in the memory logs and remembered the bike every once in a while having a sluggish time starting. This has been happening since probably last year. The location of the starter motor of a 2005 BMW R1200GS motorcycle. Anyway, a faulty starter motor can send too high of an amperage and fry the relay. Now, whether the ring antenna is at the same risk, I don’t know but the timing seems coincidental. I love eBay. I ordered a used one from Rev It Red in the UK. It was advertised as coming from a 13K mile bike. However, when it arrived, it looked worse than mine and mine has almost 70K miles on it. Furthermore, the positive terminal was stripped internally. The nut was rusted tight and the bolt just spun. No good. Rev It Red refunded my money though I lost out on most of the $40 shipping charge. Take 2. I ordered another used starter motor, again from a 13K mile bike, but this time from the Georgia eBayer, motowarrior. The part arrived within four days and it was superb. Top notch shape. 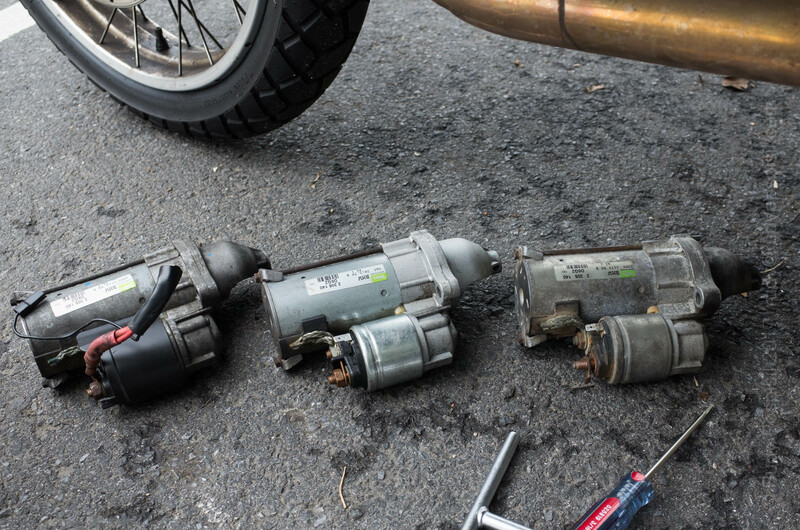 2005 BMW R1200GS Starter Motor Comparison. On the left is the Rev It Red used motor, the middle is the beautiful motowarrior replacement, and on the right is the dying one from my bike. I installed it today and wow, what a difference. The bolt on the backside is difficult to get to without removing anything off the bike. I pieced together a T-Wrench, a six-inch extension, and an elbow which yielded success. You forget how a bad performing part is supposed to perform until you replace it with a good part. The bike is s0o0o0o much happier. I’m sure that I won’t have any more relay problems. The ring antenna, I’m not so sure. I went ahead and ordered a backup in the event it happens to fry again. Fingers crossed it doesn’t. Next PostNext Catskill 3500, #14 & #15. Eagle and Balsam Mountains.